After announcing last year that the Chronicles of Narnia franchise will be "restarted" with the new movie The Silver Chair, the producers have finally found their director. Joe Johnston has signed on to direct this fantasy adventure, marking his first movie since the 2014 thriller Not Safe For Work. No cast members have been set at this time, but this story will feature characters from the original C.S. Lewis novels, who haven't been featured in any of the previous movies. Variety broke the news today, which comes eight months after producer Mark Gordon joined forces with Sony's TriStar Pictures, eOne and The C.S. Lewis Company for this restart. David Magee came aboard to write the screenplay in 2013, although the studios haven't set a release date or a production start date at this time quite yet. Here's what producer Mark Gordon had to say about bringing Joe Johnston in to direct The Silver Chair. "Joe is a wonderful storyteller who is equally at home in the biggest franchises and the most intimate character pieces. Because C.S. Lewis' story is iconic and epic, but also tender, personal, and emotional, he's the perfect choice to bring The Silver Chair to the screen." 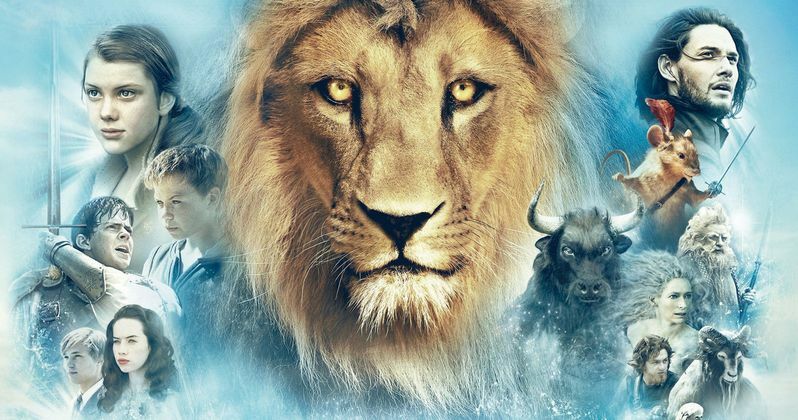 The fantasy movie franchise kicked off in 2005 with The Chronicles of Narnia: The Lion, The Witch and the Wardrobe. This story followed the Pevensie children, Lucy (Georgie Henley), Edmund (Skandar Keynes) Peter (William Moseley) and Susan (Anna Popplewell), who find themselves in the bizarre and magical world of Narnia. The cast also included James McAvoy in a breakout role as Mr. Tumnus, along with Tilda Swinton as the White Witch and Jim Broadbent as Professor Kirke. The 2008 follow-up The Chronicles of Narnia: Prince Caspian introduced Ben Barnes as the title character, along with the Pevensie siblings, who all returned in 2010's The Chronicles of Narnia: The Voyage of the Dawn Treader. This new story The Silver Chair will not follow any of the Pevensie siblings, instead focusing on their cousin, Eustace Scrubb, who heads into Narnia to rescue Prince Caspian's kidnapped child. Mark Gordon will produce with C.S. Lewis' stepson Douglas Gresham, Vincent Sieber, and Melvin Adams. The Lion the Witch and the Wardrobe got the franchise off to a good start at the box office, earning $291.7 million domestically and $745 million worldwide. Prince Caspian suffered a sharp drop, taking in $141.6 million domestically and $419.7 million worldwide, while The Dawn Treader slipped even further, to $104.3 million domestically and $415.7 million worldwide. Joe Johnston got his start as an effects illustrator and designer on the very first Star Wars movie, working on the entire original trilogy before transitioning to the director's chair. He made his directorial debut with 1989's Honey, I Shrunk the Kids, which he followed up with 90s classics The Rocketeer, Jumanji and October Sky. He also directed Jurassic Park III, Hidalgo, The Wolf Man and the Marvel Phase I adventure Captain America: The First Avenger. Hopefully we'll have more on The Chronicles of Narnia: The Silver Chair soon.